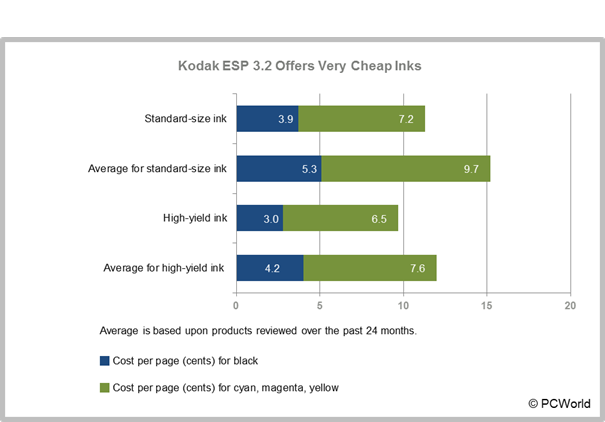 For $100 (as of July 24, 2012), the Kodak ESP 3.2 (print/copy/scan) delivers what most home users need in a home color inkjet multifunction printer--good-quality output and capable, easy-to-use software. It's neither the swiftest nor the quietest printer on the planet, but it gets the job done and serves up the finest-quality glossy photo prints you can get from a consumer-grade MFP--a talent shared by other Kodak printers we’ve seen. Kodak has one of the friendliest and most colorful installation routines in the business. The software bundle handles scanning, OCR, and even 3D photos; and you can control everything from within a single nicely rendered interface. The ESP 3.2 offers both USB and Wi-Fi connections, so you can operate the machine tethered or untethered. Controls consist of a 2.4-inch touchscreen LCD and contextually lit (that is, lit when needed) buttons surrounding it. Kodak arranges menus and options in logical order, which helps make the unit easy to use. The ESP 3.2's paper-handling features are bare-bones. A 100-sheet rear vertical feed sends paper in a straight path through the MFP to the 50-sheet output tray at the front of the unit. Duplexing is strictly manual; and on the Mac side, the prompts play out on the printer's LCD instead of on your computer’s display. The scanner bed is letter/A4-size, and the unit lacks an automatic document feeder. The lid doesn't telescope, either, so you'll have to deal with ambient light when scanning thicker materials. A major strength of the ESP 3.2 is its output quality. You might not think so after examining text and monochrome pages printed at the MFP's default settings--there's the occasional glitch. But if you switch the driver to Best quality, you'll get great text and graphics--at some sacrifice in speed and ink usage. Color graphics printed on plain paper look merely decent, with human faces marred by a slightly cartoonish cast if you look closely; but the ESP 3.2 shines when you switch to photo paper. The resulting photos are no sharper than those from rival vendors, but they have a far more realistic palette. The ESP 3.2's ink costs are attractive, too. Even with the standard-capacity, 335-page black cartridges ($13) and 270-page color cartridges ($20), you're talking only 3.9 cents per black-and-white page and 7.3 cents per color page. That's extremely cheap for an entry-level inkjet. You can lower your per-page costs further by using series 30XL cartridges--to 3.0 cents per black-and-white page with the 670-page black cartridge ($20) and to 6.5 cents per color page with the 550-page color cartridge ($36). If you're looking for a fast printer, seek elsewhere. The ESP 3.2 is among the slowest printers we've tested recently. Monochrome pages roll out at at a pedestrian 5.9 pages per minute on the PC and 3.9 ppm on the Mac. Snapshot (4-by-6-inch) photos print at 2.4 ppm on plain paper and at 1.2 ppm on glossy photo paper. Full-page photos take 2 minutes, and copies exit at 3.3 ppm. If you want a combination of great photo quality, scanning and copying options, and low-cost ink, the Kodak ESP 3.2 is a good choice. The output (with the aforementioned caveats) and amenities, such as ease of use and software, are top-notch. The Epson Stylus NX430 has a similar price tag and features, but its inks are more expensive. Another option is to pay a bit more for the Canon Pixma MG4120, which offers automatic duplexing to help you save paper. Great photo output, nice documents (at best quality), and inexpensive ink more than compensate for this inkjet MFP's slow and slightly loud operation.